Is Provincial Nomination the best way to increase your Express Entry CRS Score? The low point score or CRS (Comprehensive Ranking System) score remains the key concern of the most of candidate registered in the Federal Express Entry System of Canada. If point score of an applicant is quite low compared to the current demand in an express entry draw, the he has to wait for indefinite time. Since express entry account remains valid for 12 months, therefore, if any candidate don’t get the Invitation to apply within this period, the EE profile expires and consequently, the applicant needs to create new profile again in the system. 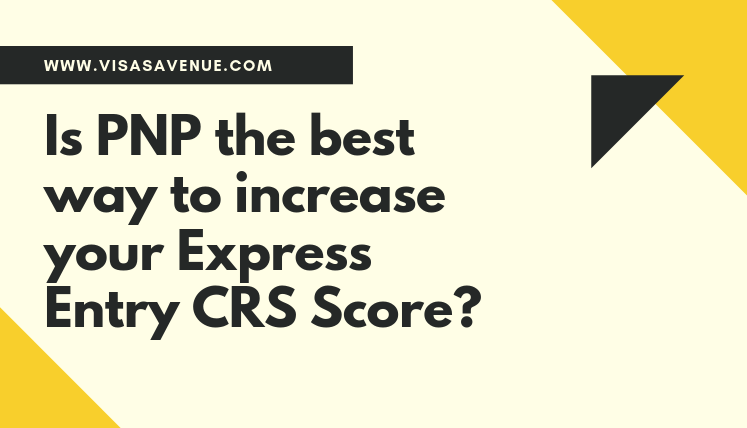 How to increase the express entry CRS score? Considering all the above process and scenario an applicant has to find out a way to obtain the Canada PR Invitation as he/she the wait for ITA must not be eternal. But what is the way out? Well, increase in the CRS score is the only option, so that your point score can reach close to cut off announced by IRCC (Immigration Refugees and Citizenship Canada) for every draw). There certain ways you can obtain the bonus points and hence, increase the total point score. For instance, you can learn French to get the extra points for the same, increase your IELTS band score for English proficiency, or claim points for sibling in Canada (if any), etc. However, to get massive addition of points to your CRS score, you can apply in the Provincial Nominee Program of Canada and get provincial Nomination. You can apply in the federal express entry system of Canada to raise your point score by 600 additional points. The Express Entry stream of every Provincial Nominee program (PNP), allows it to explore the Express entry pool and subsequently notify the suitable applicants to apply in the relevant EE Stream of the PNP. If a candidate apply in the express entry stream of provincial nomination program and qualify for provincial nomination, he/she becomes eligible to receive the 600 additional CRS Points in the EE system based on the provincial nomination. The addition of such huge points through PNP increase the total express entry CRS score of the applicant massively. For instance if an applicant is having the 400 points, the addition of 600 points will make his total CRS Score equal to 1000 points. Needless to mention that the candidates get the Invitation to Apply from IRCC in the subsequent EE draw. If you wish to increase your CRS score through provincial nominee program (PNP), you may get in touch with certified Canada migration specialist at Visas Avenue to confirm eligibility and apply in the most appropriate provincial nominee program of Canada. You may contact Visas Avenue migration experts on Toll Free Number- 78-18-000-777. Moreover, to get your eligibility checked and subsequently, receive a call from the expert, you may fill the free assessment form. Which is best visa to apply Permanent residency in Australia in 2019?